As I mentioned in my previous post, I changed up my standard chili recipe just a tad, mainly to use fresh tomatoes that I got a the farmers' market and no meat. Saute onions until soft in olive oil. Add garlic and cook for 1 minute. Add tomatoes and sprinkle with salt and pepper. Allow the tomatoes to break down some, about 5 minutes, before adding beans, sauce, and chili powder. Bring to a simmer and cook covered for 20 minutes or until tomatoes are softened. Raise temperature to medium and add bell pepper and corn. Cook for another 10 minutes until veggies are softened. 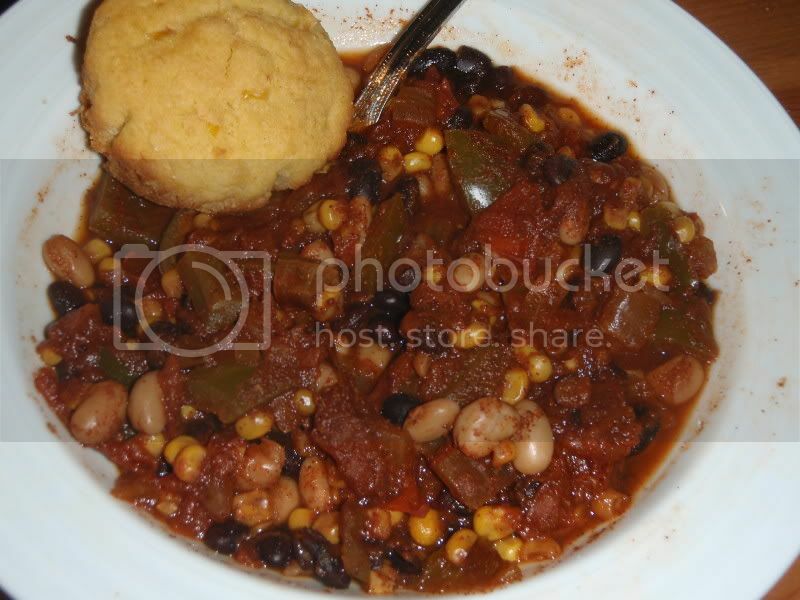 Serve in bowls with cornbread.